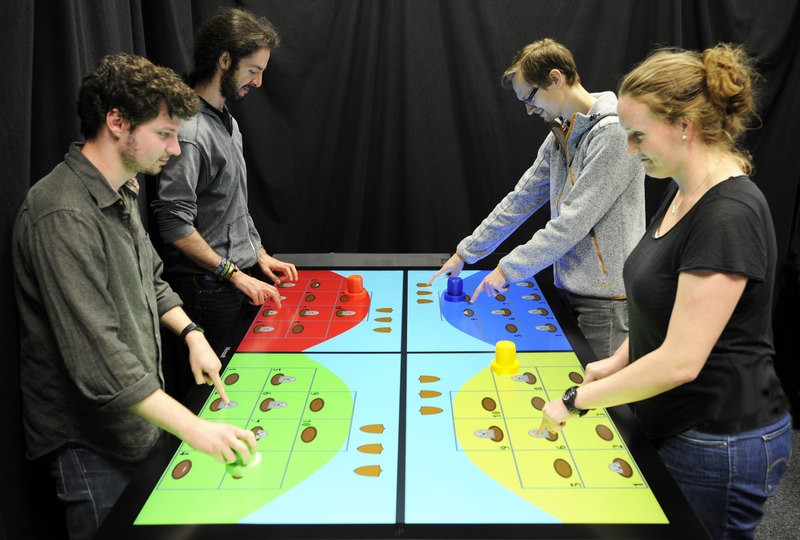 Tangibles on multitouch tabletops increase speed, accuracy, and eyes-free operability for individual users, and verbal and behavioral social interaction among multiple users around smaller tables with a shared focus of attention. Modern mul- titouch tables, however, provide sizes and resolutions that let groups work alongside each other in separate workspaces. But how aware do these users remain of each other’s actions, and what impact can tangibles have on their awareness? In our study, groups of 2–4 users around the table played an individ- ual game grabbing their attention as primary task, while they also had to occasionally become aware of other players’ ac- tions and react as secondary task. We found that players were significantly more aware of other players’ actions using tangi- bles than those using pure multitouch interaction, indicated by faster reaction times. This effect was especially strong with more players. We close with qualitative user feedback and design recommendations. This research is part of the TABULA project. The project aims to teach complex and abstract concepts in computer science. The fact that tangibles create a higher awareness for the work of a collaborator might help students to interact more with each other and therefore easier learn the complex topics from computer science. Christian Cherek, David Asselborn, Simon Voelker and Jan Borchers. Off-Surface Tangibles: Exploring the Design Space of Midair Tangible Interaction. In to appear: Proceedings of the 2019 CHI Conference on Human Factors in Computing Systems, CHI '19, ACM, New York, NY, USA, May 2019. David Asselborn. Reaching a New Dimension: Using Tangibles for 3D Object Rotation. Masters's Thesis, RWTH Aachen University, Aachen, September 2018. Christian Cherek, Anke Brocker, Simon Voelker and Jan Borchers. Tangible Awareness: How Tangibles on Tabletops Influence Awareness of Each Other’s Actions. In Proceedings of the 2018 CHI Conference on Human Factors in Computing Systems, CHI '18, pages 298:1–298:7, ACM, New York, NY, USA, 2018. Alexander Neumann. User Friendly Tangible Construction Kit. Bachelor's Thesis, RWTH Aachen University, Aachen, September 2016.